Vanita L. Edleman (nee Kramer), 97, of Lorain, died Sunday November 18, 2018 at Avon Oaks Nursing Home in Avon. She was born May 26, 1921 in Lorain and had been a lifelong Lorain area resident. Vanita graduated from Lorain High School. She worked as a Sales Manager for the May Company Department Store in Sheffield Centre for over 25 years retiring in 1986. She was a member of St. Mary Catholic Church in Lorain and a member of the former St. Joseph Catholic Church in Lorain where she was active in church functions. Vanita enjoyed getting together with her family, cooking, baking and knitting baby sweaters and hats for her grandchildren and friends. 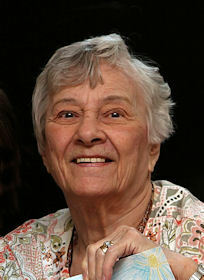 She is survived by her children: Roger (Nadine) Edleman of Elyria, Drew (Alexis) Edleman of North Ridgeville, Lynnae (Lee) Jaykell of San Diego, California and Cheryl (Jack) Koch of Avon Lake; 8 grandchildren, 12 great grandchildren, 2 great grandchildren and sister Germaine Breno of Murrieta, California. She was preceded in death by her husband Ray Edleman in 2010, infant daughter Joyce Edleman, parents Leo and Anna Kramer (nee Mulcan), brother Virgil Kramer and sister Mercedes Sandiford. The family will receive friends Tuesday November 27th from 3:00-7:00 pm at the Gluvna-Shimo-Hromada Funeral Chapel, 3224 Broadway Ave, Lorain. Funeral services will be held Wednesday November 28th at 9:30 am in the funeral chapel followed by the mass of Christian Burial at 10:00 am at St. Mary Catholic Church, 310 8th St, Lorain. The Rev. Daniel Divis, pastor, and Deacon Lou Maldonado will concelebrate. Burial will follow at Calvary Cemetery in Lorain.